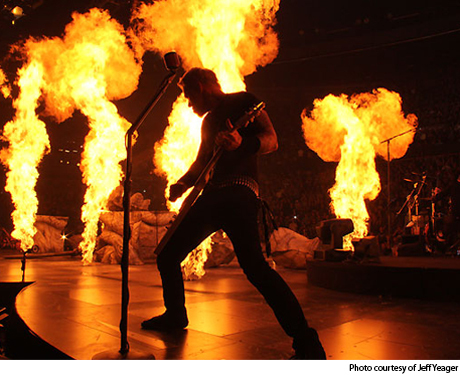 Riding high on the filming of a new 3-D movie for theatrical release, and an accompanying stage show valued at over $1 million, hard-rock masters Metallica hit the Rogers Arena stage running in Vancouver. Those in the sold-out arena crowd, knowing full well the band had handpicked them for the filming (along with lucky bangers in Mexico City and Edmonton), were completely unhinged. It seemed like Metallica themselves might take a backseat to the crowd and the enormous, almost comical stage, which filled the entire arena floor, save for 1,100 lucky pit-dog bastards. But when "For Whom the Bells" kicked in second song, it was clear exactly whose show this was. Metallica classics were the theme of this show, being billed "The Full Arsenal," and even without the elaborate, career-spanning stage show, the band were commanding the capacity crowd with tracks like "Ride the Lightning," "Fuel" (quite likely the most overrated Metallica song, but sounding good here, pyrotechnics singeing eyebrows well into the tenth row), and "One," with a spectacular, war-torn laser and pyro intro. The sound was very full, heavy and bottom-loaded to all hell. In fact, it was so sonically overwhelming that one Metalli-nut in front of me elected to turn his back on the band the entire show, thrashing violently and screaming every single lyric directly into his buddy's face. Buddy didn't seem to mind. At times, the immense stage had the mobile members of Metallica lost on its four different arms (it was shaped like an elaborate, spiky bow tie), but they did make an effort to converge in the middle and bro out with drummer Lars Ulrich, who spent most of the two-hour-plus set banging away on his kit while standing. The mid-set Black Album medley resulted in an energy dip, the band and crowd taking a break after blowing their, ahem, loads on newer material that no one really cares about (something about "Cyanide, off their last album Death Magnetic, just sounds clunky live). Luckily, a pair of …And Justice for All tracks -- complete with an enormous Lady Liberty statue carefully assembled by onstage workers, which was then brought down in a crumbling heap -- picked the tempo and intensity of the show right back up. Bassist Robert Trujillo's low-to-the-ground crab crawl, weirdo thing routinely deserves a separate mention, so there you go. And guitarist/vocalist James Hetfield and lead guitarist Kirk Hammett? Always on fire. Which leads me to the spoiler alert: near the end of quintessential Metallica rocker "Enter Sandman," an elaborate staging of chaos had the majority of the fans in shock and silence. It's the cleverest live-show disaster "prank" ever, and leave it to Metallica to throw little bits of foreshadowing through the night before ending with the disturbing climax (which takes balls, since the band has been victim of actual, onstage carnage in the past). Once order was restored, a neat little Garage Days-style session ended the show with some classic tracks from Kill 'em All. Then, after extended goodbyes from all four members of the band, the four horsemen of the heavy metal apocalypse went back to their non-maniacal lives. Chances are, Lars stands when he eats.